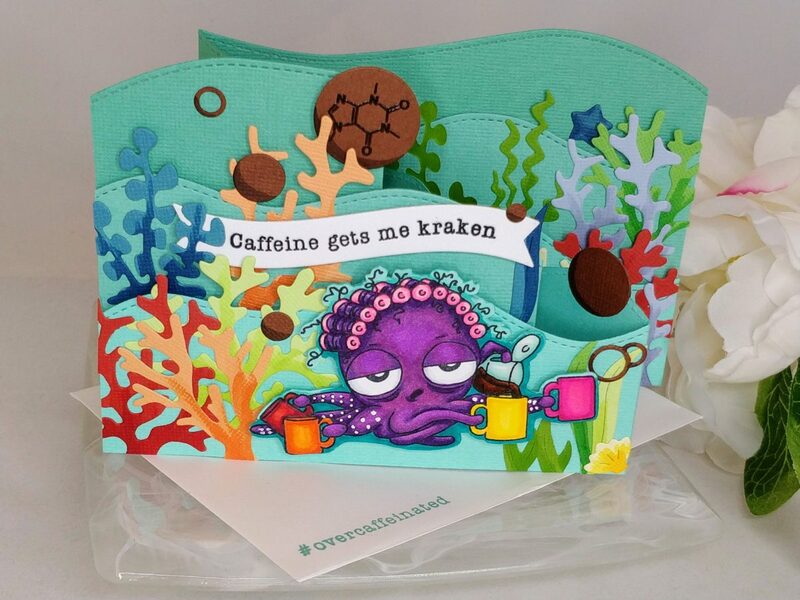 I used the Caffeinated Octopus stamp set from The Rabbit Hole Designs for this card. Love it! She’s part of a whole line of java loving critters. Go check them out! So what do you think of it? Fun, right?! In the video I promised a link to the spinner disks and this white pen, my new favorite! (Thanks again Niccole!) Let me know if you have any questions 🙂 And don’t forget to head over to The Rabbit Hole Designs for lots more inspiration and to see how to qualify for some of those fun prize packs they’re giving away to celebrate their grand opening! 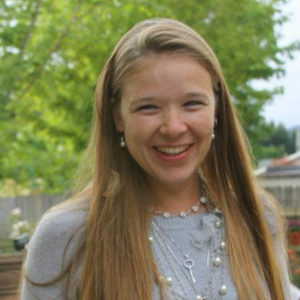 This site uses affiliate links when possible, but only for products I love and actually use. Wow! This is such a cool card! Thank you for sharing the measurements… I might just try a design like this! Pingback: The Rabbit Hole Designs & Coffee Loving Cardmakers Blog Hop for the 13th | Coffee Loving Cardmakers! WOW! I am speechless! That is beyond cool! Thank you for the video and the measurements! WOW!! This bridge card is super! Love that octopus! Thanks for the video! Another winner Amanda! I love the bright colors on all of your cards and I enjoy watching your videos after I visit all the blogs! You go alllll out in your designs. This is really cute. I have only made this sort of layered card once, for my best friend. She is worth all of the time and effort. Yours is just adorable!!! Wow. What a wonderful scene! Perhaps Spongebob can come over for a few cups of coffee! Wow! So much fun! Love all of the layers this has and so colorful! You are a really great cardmaker! Glad to have found you via this hop! OMG!! your creativity is awesome love the card, the colors so pretty. Thanks for the video I will have to try making this card. The stamps are so adorable. Wowza, this is absolutely fantastic! LOVE LOVE LOVE THIS! What a wonderful card fold! Thanks for the video! Love everything about it! So glad to be introduced to this new company “The Rabbit Hole Designs”! I love your card!!! Awesome bridge card, thanks for the video! WOW! This is a fantastic card! I love the octopus! Holy smokes, your card is awesome! Ahhh-mazing! This card has #allthethings. Great job! Amazing! So bright and cheerful and so many wonderful details!! Fabulous card! Love the sentiment and octopus image! Great coloring and details! Amanda, you have outdone yourself again! Great card and video! Thank you so much for joining us and all the time you gave us. I personally know how time-consuming these videos are, we can never say thank you enough. OMGosh Amanda you’ve created an awesome card!! Lovin’ the spinner, Wonderful video! Wow. Awesome!! Someone is going to be very lucky to receive this beauty!! Wow. What a wonderful card!!! Love everything about it. What a beautiful and fun card! I love the image, but it really comes to life with the movement you provided. Gorgeous! WoW! 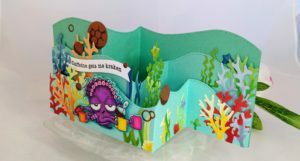 That 3d fold is AMAZING and adds delightful depth to your fab underwater scene with that terrific octopus!! Holy smokes, Batman! That is amazing!!! You put a lot of time and effort into your card as well as the instructions for the video for everyone. Thank you! WOWWOWWOW! What a fun and spectacular card! Wow! I LOVE your amazing bridge card! The detail is really spectacular! I am in awe! Your card is amazing. I love the layout. Another amazing card with this set! Awesome job! Oh my goodness!! Your card is MAGNIFICENT!!! I love it!! This card is amazing! I’m going to be spending some quality time with the video to try this too – thank you for sharing! Fabulous card. Love the colors and design. Thanks for sharing the size information. This card is “kraken” me up! Sorry! I couldn’t resist because it really is a fun stamp set and your design is amazing! Wow! Wow! Wow! Your project is really awesome!!! Love all the details!!! What an awesome card..love the way you have designed it and its so colourful and cheerful. WOW!! Amanda!! You are SO talented!! I have loved each of your videos, and the cards you’ve made!! Thank you so much for the inspiration~ I am in awe! I have to agree with Robyn, you are very talented. I have not been disappointed when visiting your blog during this blog hop.. Love the fun dimension you have added to an already fabulous stamp set. This is so stunning! Amazing work! This just goes above and beyond and could be a prize itself! Incredible! I don’t drink coffee, but this card is adorable! Whoa! The design of this card really fits with that fun octopus!! WOW! This is fantastic design! Such a great design. I like her home decor. Wow this is awesome. 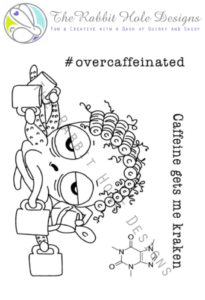 I love looking at all the details and then get to see the over caffeinated octopus. This is a great card, so many bright colors and fun.